When you think about Amazon’s Kindle electronic reading device, you might not automatically think “green”. And, with its $359 price tag, you’re definitely not thinking “frugal”. So why the heck am I reviewing this product? Because I own one. My Kindle is one of my most treasured possessions. Why? Well, I could give you a hundred reasons, but the biggest is because it makes my reading habit easier to maintain. And, I truly believe that the Kindle is green, and that while not exactly frugal, it can help you save money in the long run. So, let’s dive in to find out why Amazon’s Kindle is so darn fabulous. If you happened to catch my post, “3 Cool Ways To Green Your Reading Habit“, then you know that paper books are bad for the environment. Planet Green, a Discovery company, had these fascinating but sobering facts on the consequences of our book buying habits. There is a book published somewhere in the world every 30 seconds. One tree will provide enough paper for only 116 averaged sized books. It takes 4.4 gallons of water to produce one book. For every ton of recycled paper that’s used in a book, 24 trees are saved. Now please understand…I love books. I’ve been an avid reader since childhood, and consider books and reading to be essential components to my personal happiness. So, I’m not making the case that people should stop reading books. I’m simply trying to illuminate an aspect of reading that, after decades of being a reader, didn’t hit me until a few months ago. That aspect is: books cost trees. Wow, let me count the ways. First of all, let’s address the Kindle’s screen, which seems to me to be most people’s biggest objection before they see it in real life. The somewhat blurry picture on the right is my first-generation Kindle. It doesn’t do the screen justice, but you can at least see what it looks like. The Kindle screen is nothing like anything you’ve ever seen before. It’s not like a laptop screen, which is bright and catches glare easily. The Kindle screen is soft. It really looks like ink and paper (only better). My opinion it’s actually much easier on the eyes to read from the Kindle screen than a piece of paper. The reason is because in books, the paper is white, and words are black. I know I’m stating the obvious here, but it’s important. So, you have this sharp contrast of white and black on the page. And when you’re outside, especially in the sun, it’s even sharper because the white page kicks back so much light. The Kindle screen is gray, and the type is black. This is a much softer contrast, which is very easy on your eyes. Because of the screen’s amazing technology, it’s even easier to read outside. Why? Because there’s no glare like you have with traditional digital screens. You can’t see your reflection, and you don’t have to squint from the brightness. I travel a lot. And, I’m a very fast reader. So usually this means I have to take at least 3 books with me whenever I go on vacation, because I fly through them. Books are heavy. And, they take up a lot of room. If you’ve every schlepped a backpack full of books through a crowded airport, then you know what I mean here. The Kindle eliminates this annoyance. It stores 200 books. That’s all you have to take! If you find yourself hankering after a book while you’re away, gone are the days you have to go out looking for a bookstore. You simply connect to Amazon’s store by turning on Whispernet (Amazon’s wireless connection), and buy it right from your Kindle. You have your book one minute later. And there’s no cost to download it. There’s also no monthly wireless fee. Your access to Whispernet is included in Kindle’s price. So, you never have to worry about not having something good to read, because you can surf and shop for books, magazines, and newspapers instantly. 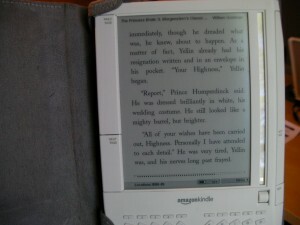 You can even read major blogs through the Kindle. And if you have Word documents you want to read, you can email those to a special Kindle email address you get. Amazon reformats the document for Kindle, and then delivers them to the device. It’s 15 cents per document for this service. I’ve done it several times, and it works well. Another cool thing about the Kindle is the access to immediate information you have when reading. If you’re unfamiliar with a word, you just highlight it. Kindle will open the dictionary and tell you exactly what the word means. Usually, I’m too lazy to go get a dictionary or hop online to look up a word. So, I’m learning more words because Kindle cut out that step. It’s also easy to navigate through the book itself. You can book mark pages, “clip” pages you want to reference later, and easily hop through chapters. Kindle also remembers automatically where you left off the last time you were in a particular book. So if you decide to switch books, you don’t have to worry about losing your place. Next time you open that book, you go right to where you left off. So, HOW Can I Save Money With Kindle? Kindle has over 285,000 titles available for download, and that number is growing daily. Almost every book you buy for your Kindle is going to be cheaper than what you’d pay in a bookstore. For instance, most NY Times Bestsellers are $9.99. The cool thing is that if you’re into reading older books, like the classics (think Jane Austen, Charles Dickesn, Voltaire, etc. ), you can get books for next to nothing for your Kindle. Most classics are $1-$3 each. Now, I love the classics. So for me, this is a huge money saver. Case in point: the last classic I bought was Jane Eyre by Charlotte Bronte. Final price: 99 cents. So even if you’re addicted to the new releases or you love the oldies but goodies, you’re going to save money on books with the Kindle. At least, compared to buying them new. And HOW Is the Kindle Green Again? Buying digital books means that you’re not buying paper ones. So, no trees have to die to support your reading habit. Not to mention the water and glue that goes into every book, the bleach to dye the paper, the gas used to truck that book across the country…you see where I’m going here. Kindle cuts all that out of the system. I feel very, very good about this. But Isn’t the Kindle Impersonal? For you bibliophiles out there, I can understand your reluctance to make the switch to digital. After all, books smell good. They feel good. They’re like an old friend. When you curl up with a good book, it’s an intimate experience. 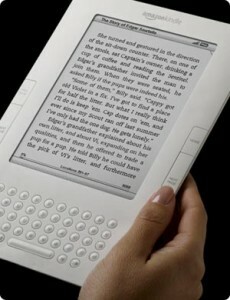 Does Kindle replace the tactile experience of reading? But the Kindle stands alone. It’s a different way to read books. Is it the exact same as curling up with an antique volume of Shakespeare? No. But, I still feel connected to the experience of reading with the Kindle. I still love it. There’s a good reason why the Kindle has almost 4,000 positive reviews on Amazon’s site. Most people simply fall in love with this thing. I know I sure did. I was amazed at how effortless reading from the Kindle was when I first got it. And now, I can’t imagine traveling without it. Want to check out the Kindle for yourself? Any of the highlighted links for “Kindle” will take you to the Greenest Dollar’s Green Store on Amazon so you can have a looky-loo. If you’d like to skip going through the Green Store, you can click here to go straight to Amazon. I stopped buying books….except for books on those pesky summer reading list that my kids keep bringing home at the end of the school year to torture themselves with. I borrow my books from the library. I also borrow books on CD and listen while I craft or do house work. I’d like to think I’m being “green” when I borrow form the library but one of the main reasons is because I’m trying to be frugal – can’t justify spending $25 if I can borrow it from the library. But I can see how kindle can be a good thing. My kids love gadgets so this might get them to read more. I think. I hope. I’ll put that one on their b-day or Christmas list. I wonder how Amazon’s children books selection is for kindle. I think their children’s selection is pretty good. They have a whole section on the Kindle store (at Amazon) just for children. Interesting! It looks great for holiday reading. But, I’m curious, what is the Kindle made of? How long is it intended to last? I suppose my concern is that it’s made of plastic and might not be easy to dispose of responsibly once it does reach the end of its lifespan. I wonder how we could get numbers on how many books=Kindle in terms of environmental impact. Thanks for introducing me to the kindle, but for now I will stick with my paper books. I usually buy used and pass along when I am done, so that makes them frugal and green in that I am recyceling them. Please check out my blog as I am having my first ever contest. It is to benefit another single, work at hom, hoemschool mom (like myself.) Thanks! I too love my Kindle. I take it with me each day and read before appointments or whenever I have a few minutes. I mainly read non-fiction on it: blogs and magazines. I wish the blog selection was better – more indie/smaller blogs, like yours. Wow, well i guess one can not argue the fact that “kindle” saves paper and perhaps time, although there are distractions while book shopping whether it be in person or online. I am a bit disappointed at this plug for amazon owned Kindle (no wonder the good reviews), books are a true treasure to be shared, we need to educate people to buy used books, share books with friends, visit the library. There is fear among the used bookstore owners that Kindle will hurt us, permanently, i believe a certain segment of our society will gravitate to Kindle and the like, however, i also believe that one point you missed is that being “green” and caring for our environment also falls into community, creating community and being a part of community – most used bookstores are VERY active in the local community, hosting local authors, reading groups, story hours, coffee clubs…. raising a level of awareness. And of course, buying local helps support not only the bookstore owner, who usually lives and shops in the community, but it supports the banker, the auto mechanic, the farmers market, etc. the trickle down effect on buying local is HUGE. As a used bookstore owner, who normally loves your site … i wish you had just mentioned a couple of other facts. Like the processing power (energy) behind operating a website like amazon, and Kindle. Thanks so much for taking the time to write in about this! I’m so sorry it I haven’t been responding to every comment; I’m on vacation in Louisiana visiting family and the Internet signal here is terribly slow. I want to quickly respond to Margi’s comment. Margi, I completely agree with you; I love used bookstores, and feel strongly that buying used should be people’s first option. The only reason I didn’t bring that up in this post is because this was solely a review of the Kindle. I have written several times in the past on the benefits of buying used books versus new. Now, although I love my Kindle and feel it’s a great product, I don’t believe that it will ever pose a real threat to used bookstores. I just don’t think enough people will want to jump into digital reading. Granted, I’m not in that industry, but it just seems as if more people will always want the more tactile reading experience of ink and paper. Thanks again to everyone for writing in. I love it when a post sparks debate! I’ll be back to my regular posting and commenting starting on Thursday. I’m sure you would love reading Laura Fair Rose. It sounds as if the Google version, even though it’s still corporate-owned, would allow independent booksellers in on the action. Thought you might be interested! It seems that you’re happy to grab information on the Kindle’s green features and the not-so-green aspects of books, but I feel like you didn’t really give this a balanced look. Books DO cost resources to produce, but once you have those resources, the book is finished, and it’ll last for maybe 40 years. What’s the lifetime of the Kindle? Is there mercury used in its construction? What’s the lifetime of its Li-ion batteries? How much power are you using to charge it and run it? What are the costs associated with building, assembling, and shipping a kindle? Or the costs of maintaining servers and data centers to service it? All of those have an impact on its greenness as well. The used book store point someone brought up earlier is pretty valid. The average price of a used book changes your calculation on how much money a Kindle saves you. Used books are also already printed, so you’re picking up what someone else doesn’t want rather than consuming the resources of printing a new one. I’m not anti-Kindle, but I think your review was a little slanted. I love my kindle…I never even thought about it being \green\ just that I had easy access to my books and then didn’t have tons of books laying around that I had to figure out what to do with. I think I am exposed to different kinds of books as well. Because I live in a rural area, there is not Borders Books around me or a used book store for that matter so I can go on Amazon and look at different Genres and upload them to Kindle and read on.